Oconee County should not make that same mistake. Instead, architect Robert Smith said, the county should build a new government complex at the end of an open, green corridor that would connect the current school and arts facilities and the courthouse in a revitalized downtown Watkinsville. No one in the audience spoke against the plan. “I think you need to appreciate the historic significance of the courthouse site,” former Board of Commissioners Chairman Wendell Dawson said. A courthouse has been at the current location on Main Street in the center of Watkinsville for more than 200 years, he added. In rather short order, the current members of the Board of Commissioners are going to have to decide how they feel about the courthouse. Before them is a request to include $25 million in 2015 Special Purpose Local Option Sales Tax for a new courthouse or judicial facility. That issue is scheduled to be on the ballot on May 20. The most discussed location for a new facility is next to the jail on Experiment Station Road, near where the Board of Education already owns land. The planned widening of Experiment Station Road to a four-lane highway with a median would cut that property off from the current courthouse. Smith’s plan would leave the jail where it is and use the current courthouse as a focal point in a government, residential and commercial three-block green area stretching from Main Street to Thrasher Drive/School Street in front of the existing Kindergarten Building. Smith, son of former Georgia Rep. Bob Smith, has not put a price tag on his project, and he said at the meeting at the Watkinville Community Center on Wednesday night that he didn’t think the plan needed to be implemented in one step. Rather, he said, he was trying to present guidelines for the future. Smith, currently living and working in Atlanta, developed the plan as part of his master’s thesis, which he completed at the University of Notre Dame in 2011. The discussion of a new, $25 million courthouse/judicial facility, put forward by Chief Superior Court Judge David Sweat and Sheriff Scott Berry late last year, made discussion of the plan timely. Commissioners John Daniell, Jim Luke and Mark Saxon were at the meeting on Tuesday night. Commission Chairman Melvin Davis, who has worked to keep the discussion of the courthouse on the agenda, and Commissioner Margaret Hale were not in the audience. Watkinsville Council Member Brian Brodrick introduced Smith to the audience. Smith told the audience that the new courthouses in Barrow, Jackson and Walton counties were attractive in their own right, but they are isolated from the centers of Winder, Jefferson and Monroe, respectively. He estimated it would take 51 minutes to walk from the city center to the courthouse in Barrow, 50 minutes in Jackson, and 22 minutes in Monroe. But walking in each of those cases would be difficult because they are not designed to be pedestrian friendly, he said. His plan for Watkinsville focuses on pedestrian flow along tree-lined streets and an open view from the courthouse to the new government building. Smith calls the new building he is proposing Municipal Hall. It would sit near an expanded Oconee Cultural Arts Foundation Building and the existing Board of Education facilities. The Municipal Hall would include Watkinsville, county and educational offices. It also could include public space. 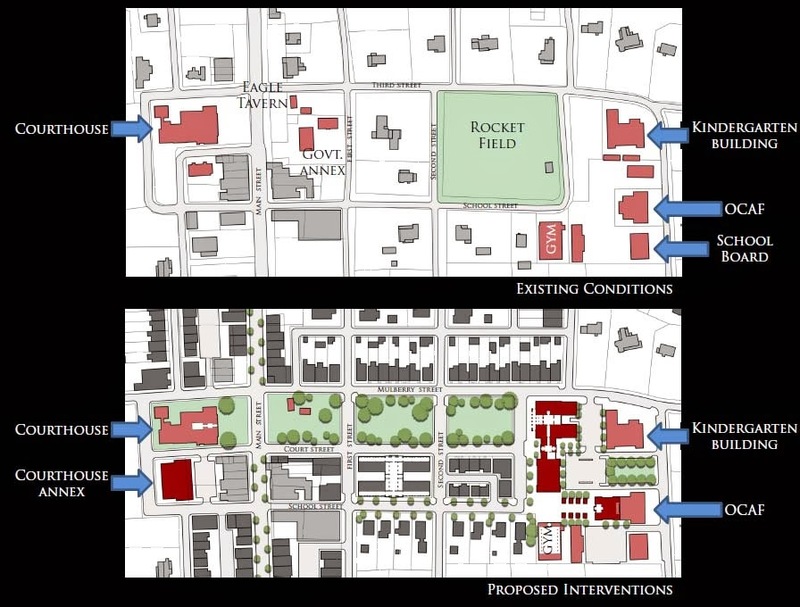 Smith’s plan would require that the government acquire three blocks. The first is the one, partially owned by the county, where Eagle Tavern stands. The county also would need to acquire and remove the two buildings that are now called the courthouse annex and that the county leases for office space. The second block is in private hands but controlled by a single owner. The third block is Watkinsville’s Rocket Field. Smith would rename what is now Third Street as Mulberry Street. He would create a new street between Mulberry Street and the existing School Street called Court Street. He also proposes that a new courthouse annex could be built next to the existing courthouse on land now being used for the county Board of Elections Office. Additional parking for the county would be obtained along the streets that make up what Smith calls Civic Green. Does Bob Smith (Robert's dad)own property right in the middle of the proposed location (north side of School Street, I believe). Does this figure in to Robert's recommendation to keep the courthouse in the center of downtown? I could be wrong -- just asking. I checked the tax records in two ways. First, I searched for Robert H. Smith. None of the property listed for Robert H. Smith is in the area of the proposed project. I also looked at each of the properties surrounding the project. None of these is listed as belonging to any person named Smith. It is possible that there is a connection that is not obvious, but the name Smith is not linked to any of the properties in question. As someone who's had to go to all of the courthouses mentioned, I agree that their locations are fairly nonsensical. The plan looks fairly nice but is it really necessary? Also, who will be tasked with developing the south side of the two blocks? Will this be private mixed use type stuff or are they going to be government buildings? The public seems pretty clear. The "leadership" now faces the problem of listening to its constituency of having an empty palm. What to do?